What was the first satellite launched by the United States? 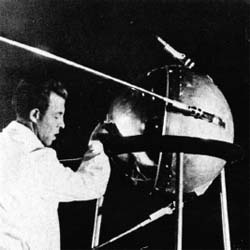 The United States had a space program nearly ready to go when Sputnik 1 was launched in 1957. Startled into action, the American government hurriedly rushed to launch the first orbiter, called Vanguard, on December 6, 1957. The launch was a failure: The rocket carrying the satellite burst into flames just a few feet off the ground. The following month, on January 31, 1958, a team led by Wernher von Braun (1912–1977) at the Marshall Space Flight Center in Huntsville, Alabama, successfully launched Explorer 1, the first American satellite, into orbit on the nose of a Jupiter-C rocket.